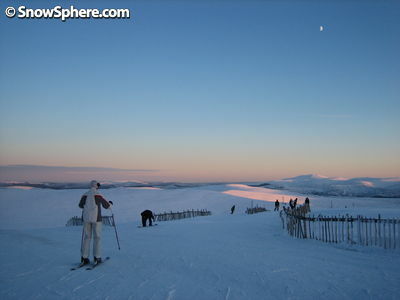 SnowSphere heads to The Lecht ski area in the Scottish Highlands for a surprisingly good bit of snowboarding in Scotland's smallest ski resort. 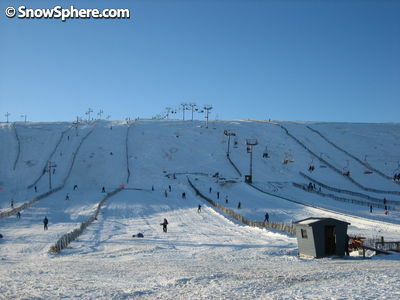 A combination of the Sterling being severely devalued against the Euro and one of the best starts to the Scottish ski season in years means that The Highlands could be on for a bumper winter this year, with many more people discovering that skiing and snowboarding in Scotland can actually be pretty good. 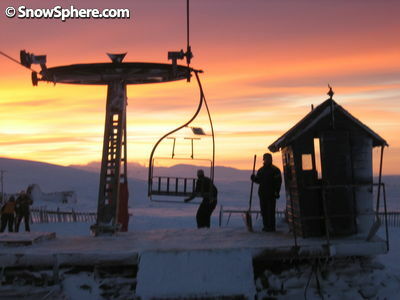 Yes - this burning sky really is in Scotland; a snowboarder glides off from the only chair lift at The Lecht as the lifty dutifully waits with his shovel. 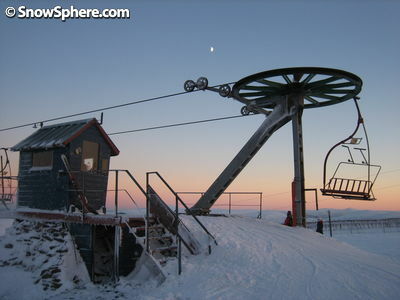 The Lecht may be Scotland's smallest ski area, but it's often the one that can open most frequently. 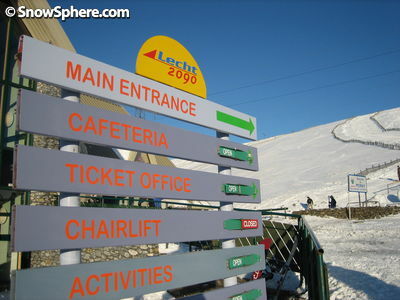 Lifts fan out from either side of the road and offer skiers and snowboarders 183m of vertical drop. We were impressed at the facillities at The Lecht. Expecting the place to be from a bygone era - it actually seemed quite modern, and the lodge that houses the cafe, ski hire and ticket office would not look out of place in the Alps. 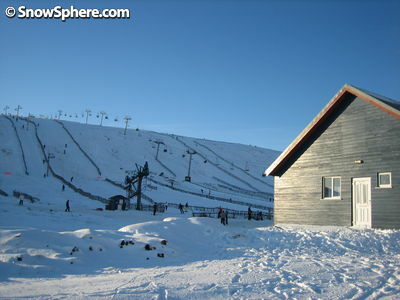 This building at the base of the slopes gave The Lecht an almost Scandinavian feel; indeed, the round, rolling hills resemble terrain found in some parts of Norway. 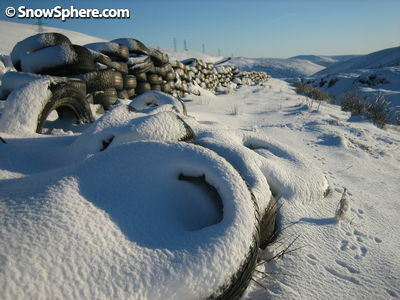 It was only early December, but there was plenty of snow, as these tyres at the base of the slope show. 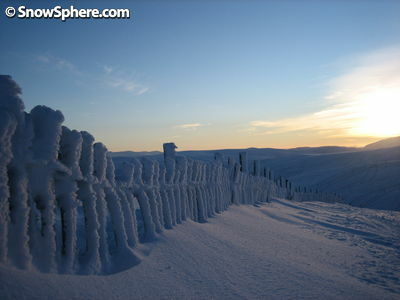 Snow fences are a classic part of the Scottish ski scenery. With no trees to hold the snow, these fences help keep the white stuff from disapearing into the ether. It wasn't that deep - but it was powder. In Scotland. In early Decemeber. So we weren't complaining! 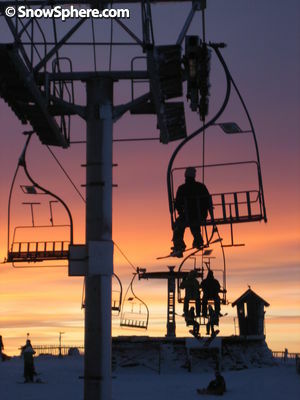 An incredible fiery sunset greeted skiers and snowboarders as they reached the top of the chair lift. Looking out over the Highlands, it was genuinely quite an amazing sight and definately proof that when the weather complies, snowboarding and skiing in Scotland can be as good as anywhere else. It was very cold at the top, and my fingers were feeling the bite only a few seconds after removing my gloves to take these pictures. Moon rise at The Lecht. A pink sky rounds off an excellent trip to The Lecht. This scene could easily be in the arctic cirlce of Norway or Sweden. 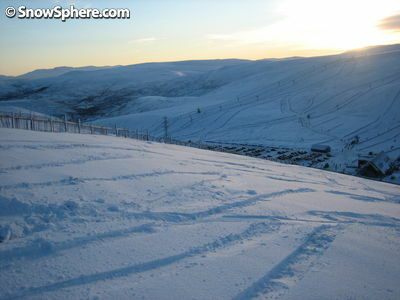 I'll definitely be back for what is hoped to be one of the best Scottish ski seasons in years. Terrain: mainly open crusiers on rounded mountain sides. No trees. Also a terrain park with rails and jumps - half pipe if snow permits appears later in the season. Getting There: The Lecht is about a 3.5 hour drive from Edinburgh or Glasgow, one hour from Aberdeen.